Crewsaver and Yak have issued this saftey notice about their throwlines. If you have one of these lines then you may return it to us with a proof of purchease or send it direct to Yak. Customer Safety is of paramount importance to us and we have identified a potential safety issue with a small number of our THROW LINES sold between May 2009 and September 2009. The safety issue is caused by the joining of rope used within the line. This means when weight is applied to the line, it may separate. The Line should NOT have any joins in it. Nothing matters more to us than the safety of our customers, so if you have bought this item please inspect the rope. Feed the throw line through your hands slowly looking for a join, this can be easily felt as a rough bur. Take care not to burn your hands during this process, if the rope is gripped too tightly or pulled to quickly. If you are unsure, or require more information please contact our Customer Service team on 023 9252 8621, Monday to Friday 8.30am – 5pm. Stop using it, and return it to YAK Paddling, Mumby Road, Gosport, Hampshire, PO12 1QA. We will of course replace your throw line and cover the cost of return. We’d like to apologise for any problems this may cause and reassure you that no other Yak product is affected. Should you have any queries or concerns regarding this safety notice, please call our Customer Service team who will be more than happy to help on 023 9252 8621. Lines are open Monday to Friday 8.30am – 5pm. 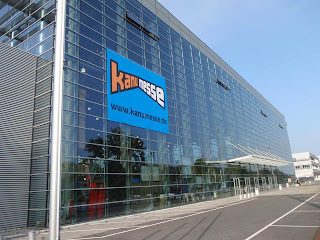 Ewart and Jim are just back from a visit to the Kanumesse exhibition in Germany. 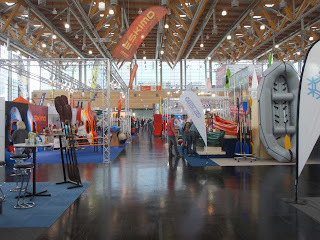 Kanumesse is the largest European trade only kayaking and canoeing show. Its the place lots of companies show off their new kit, boats and accessories. Plus it's also a great place to see new and different products. 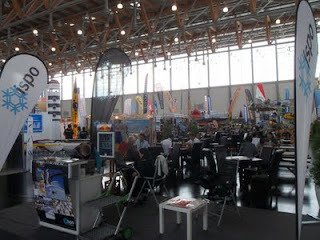 The Show is held in Nurnburg in southern Germany, and takes place in part of the Nurnburg Messe, the largest indoor display space in Europe. The show site is enormous, it make the NIA or NEC look like a pimple! 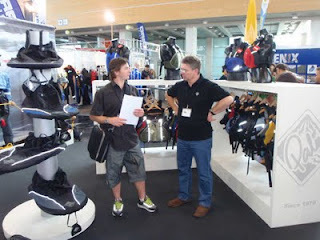 As well as catching up with all our regular suppliers we also got to see some exciting, different and new European products. There seems to be lots of smaller equipment manufacturers popping up in Eastern Europe, making some funky new gear. None of it is being brought into the UK yet, but some of it might be available soon! Here's a few pictures that the boys got while looking around the show. 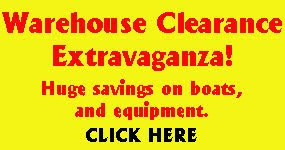 We've got some stunning bargains on offer in our webstore at the moment, now updated with pictures of the boats. We have a selection of Playboats, river runners and creek boats at some amazing discounts. Some of them are still brand new, unused and still fully wrapped up in their packaging! Others are shop soiled, and some are just older versions. After what seems like forever, Alice has finally left us to pursue what is apparently a "proper job". Surely working in a kayak shop is the best job in the world though! Alice has now qualified to become an accountant and earn some real money, plus now she will get her weekends free to go boating. So we would like to to say "Thank You" to Alice for the hard work she has put in over the years. Here is Alice in action chucking herself down the famous "Cauldron Drop" (or some may say "Ewarts Hole") on the Egua River In Italy. We're heading into the final stages of preparations here, in expectation of this years South West Canoe Show. We've got an exciting range of new products from a whole host of manufacturers. As well as all our usual Canoe Show goodness, like; Hog roast, free demos, talks and lectures, Course/coaching/holiday providers and of course loads of boats, equipment and accessories to look at. Don't forget that if you want to demo any boats ,while it is free, you do need to fill in a demo registration form. To speed things up, you can download the form, and either email, post it, or fax it back to us, or you could just bring it along with you on the day. You can find the Demo form either on the South West Canoe Show 2009 Website, or by clicking the following link. The form is a PDF, you will need Acrobat PDF reader to open it. Click here to down load Acrobat. Confluence watersports, parent company of Dagger USA, Perception USA, Wavesport, Wilderness systems, Mad River Canoes, Adventure technology and Harmony gear have recently announced new UK distribution for Wilderness systems and Mad River Canoe. Previously distributed by WWC the UK Distribution will now be handled by Palm Equipment. 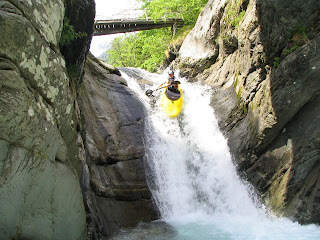 Read what Confluence watersports have to say about it here. Hopefully this will not hold up availability of boats during the change over process. 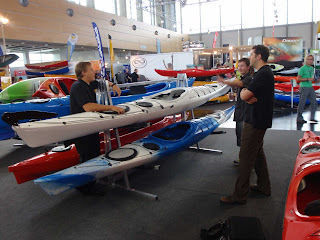 Ocean Kayak have just released two new models, The Nalu and The Torque angler. They will be on display to the public for the first time at the South Hampton boat show, But they will be available to demo for the first time at this years South West Canoe Show on October the 3rd. The Nalu is the first ever paddleboard from Ocean Kayak, the world number one when it comes to sit-on-tops. As a pioneer in the paddlesports industry for over 35 years Ocean Kayak has considered every detail to ensure the Nalu offers peak performance at an affordable price. Features include dedicated areas for sitting and/or standing and this is the first paddleboard on the market that will accommodate a backrest. It is also one of the few rotomoulded polyethylene paddleboards so is durable, stable and very tough. It is also easy to transport, store and is maintenance free. The Nalu is 3.35m (11’) long, 79cm (31”) wide and includes moulded-in fins for outstanding tracking. Two self-draining scuppers are built in and ergonomic handles make it easy to carry around. Ocean Kayak has introduced the Torque Angler, an innovative fishing kayak which has been custom built to take a drop-in Minn Kota electric motor unit. The compact motor module weighs just 20lbs (9kg) and simply slots in place in a large scupper behind the seat. When it is not required a detachable skeg can be fitted so the Torque functions as a standard kayak. The motor plugs into an outlet at the back of the kayak and the battery goes in a sealed battery box in the centre. Because motor and battery are separate, removable units it makes them easy to handle, optimizes the kayak’s trim and keeps it light for transportation. The Torque uses a Minn Kota Maximizer motor unit which delivers up to 33 pounds of thrust and offers forward and reverse drive. Speed is controlled through a control knob in the cockpit which offers variable speed control. This means that unlike with a fixed dial system, the throttle can be fine tuned allowing anglers to find their optimum speed. An extra large rudder provides excellent manoeuvrability and is operated by foot pedals to give hands free operation of the drive system. Minn Kota motors are renowned for their near silent operation and the motor unit is coated to resist saltwater corrosion. A kill switch and battery circuit breaker have been fitted for safety. The craft is a completely new design inspired by the popular Prowler Trident range of fishing kayaks so offers all the features today’s kayak angler has come to expect from Ocean Kayak. The motor and hull have been seamlessly integrated so the 4.2m (13’ 10”) Torque offers a dry, stable ride. For comfort there is a padded seat back and foot braces. Other features include a large bow hatch, areas to mount fishing accessories, a transducer compatible scupper hole and a paddle keeper. The Torque comes in two colours, yellow and sand. 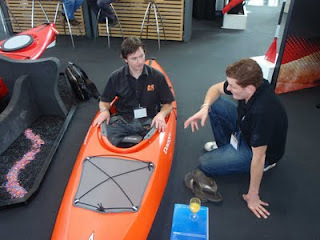 So if either of the New Ocean Kayak models takes your fancy, why not come and try them out On Saturday the 3rd of October, at the South West Canoe Show 2009. 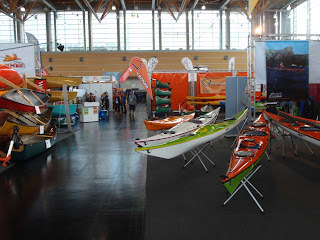 You can find more details about the show on the South west canoe show website. 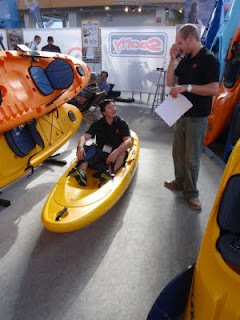 Or go the the Ocean kayak website for more info on these exciting new models.